This is the fourth album from Norwegian progressive/melodic death metal band In Vain. In Vain offer us 42 minutes of progressive death metal with a melodic death/black metal edge. 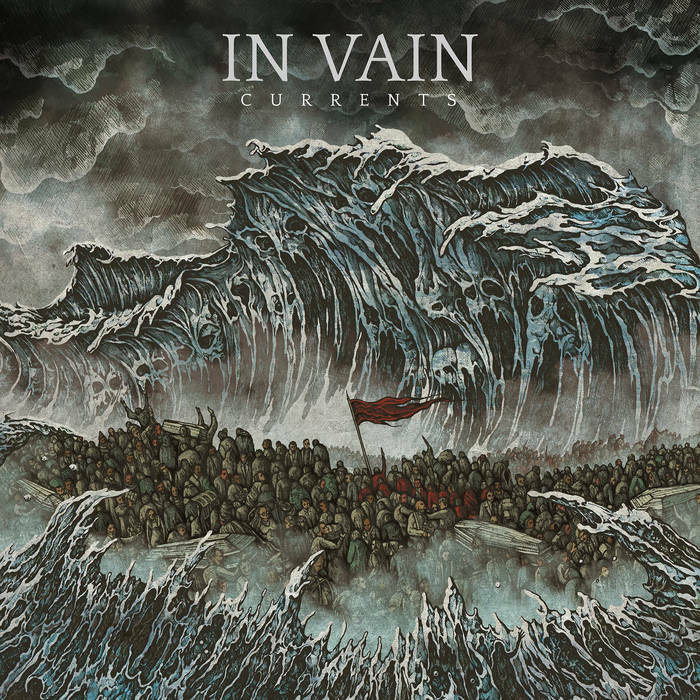 It’s a well-received offering, and Currents is a satisfying and well-written album. The songs are highly melodic and composed in such a way that they seem to flow out of the speakers and wash away the listener, taking them on an epic journey across continents to far away lands and undiscovered cultures. Frequently enhanced with various other instruments and sounds, Currents has a lot of different ideas and musical flourishes to enhance its core melodic/progressive delivery. With guitar solos that sound like liquid silk, and so many uplifting and resplendent leads, this is a rich and textured album that covers a lot of ground and delivers a lot of engaging content for such a relatively brief release. Lots of different eras of music are catered to by the guitars, whether this is classic metal, technical/progressive Death-style death metal, or a more modern, contemporary feel. This helps the album to achieve a varied, diverse finish, while still keeping everything holistically bound to the general flow of the album. The vocals mix growls and cleans with all manner of other vocalisations. The main growls remind me of the singer of Vader, while the cleans are performed with epic gusto and a progressive/power metal feel, vaguely reminiscent in places of a band like Nevermore or Communic, (although not overly so). Like the guitars, the vocals help provide a diverse and varied listen, while still allowing the songs to sound naturally placed alongside each other. In some ways Currents is an eclectic mix of styles and subgenres, but it all works very well. Despite how relatively different some of the tracks are from each other, In Vain keep everything flowing together very well, and overall this is a highly accomplished and very enjoyable listen. This entry was posted in Death Metal and tagged Black metal, Classic Metal, Communic, Death Metal, In Vain, Melodic Death Metal, Metal, Nevermore, Power Metal, Progressive Death Metal, Technical death metal. Bookmark the permalink.